Movie review: Morgan Matthews is an English documentarian whose latest, “A Brilliant Young Mind”, marks his fictional debut feature. The fact-based drama, written by James Graham, arises as a consequence of his own TV documentary from 2007, “Beautiful Young Minds”, so he never really moves out his comfort zone. The actual prodigious, Daniel Lightwing, was the one who served as inspiration. In the film, he was given the name, Nathan Ellis (Asa Butterfield), a 9-year-old boy who always had a knack for patterns, a fact that turned him into a math genius. The bashful Ellis also had a traumatic past since he was seated next to his father when he died in a terrible car accident. On that same day, he had been diagnosed with a form of autism and was being given all the support from his father who encouraged him saying: ‘don’t be afraid of what you have. It’s like having special powers.’ His understanding and super-devoted mother, Julie (Sally Hawkins), decides to enroll him in a school where the unorthodox professor, Martin Humphries (Rafe Spall), who often abuses of his medication for multiple sclerosis, will take the responsibility to prepare him the best he can to represent Great Britain in the International Mathematical Olympiad that’s about to happen in Taiwan. Not only Nathan feels and understands love for the first time, but also his mother starts a relationship with the insecure Martin. 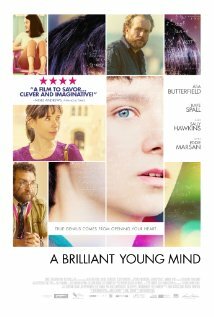 The young Asa Butterfield gives a valid performance as the introverted, picky, frank, and yet bright student, but overall the film is conducted in conventional tones, bringing immediately into mind other math-related movies such as “A Beautiful Mind”, “The Theory of Everything”, and “Good Will Hunting”. It’s indeed a heartwarming drama spurred by feel-good attitudes and honorable intentions, but I must object that there are no effective surprises in the story, as well as nothing fresh in the way it’s told. You may find yourself wishing the things were handled distinctively since the film shatters our highest expectations, becoming nearly a disappointment.